A research report published on Tuesday by the homeless charity St Mungo’s shows that four out of five (80%) rough sleepers who died in the capitol in 2017 had mental health needs, a huge increase from three in 10 (29%) in 2010. The rise in deaths of rough sleepers with mental health problems have risen sharply over the last seven years, prompting concern that specialist services are not reaching those who need them. The number of people sleeping rough has risen by 169% since 2010. Last year in England more than 4,700 people slept rough on any one night, and a far larger number experienced rough sleeping during the course of the year. The report also featured a survey of dozens of street outreach workers and 63% said they were aware of someone who had died while sleeping rough in their local authority area last year. However, only 23% had experienced a review being carried out. “With access to vital emergency accommodation and support services getting harder and harder, it is unsurprising that the number people dying on the streets is rising. Urgent action to provide rapid relief from rough sleeping is needed to turn this around,” the report stated. Having a mental health problem can create the circumstances which can cause a person to become homeless in the first place. Yet poor housing or homelessness can also increase the chances of developing a mental health problem, or exacerbate an existing condition. In turn, this can make it even harder for that person to recover. It also makes it very challenging to develop good mental health, to secure stable housing, to find or maintain a job, to stay physically healthy and to maintain relationships. The figures come amid concern about the growing number of homeless deaths and the lack of reviews into what has led to them. Out of the hundreds of deaths that have occurred in recent years, reports suggest only eight have resulted in a review. The Guardian and the Bureau of Investigative Journalists revealed earlier this year that 340 homeless people died on the streets or in temporary accommodation in the last six years, surging from 32 in 2013 to 78 in 2017. A further 59 deaths have been recorded so far this year, already more than the whole of 2016. In the capital, the only place where a local authority records homeless deaths, 158 people died between 2010 and 2017, an average of one death a fortnight. Experts and campaigners have warned that without official records, counts and reviews, it’s impossible to determine why so many homeless people are dying and design and take effective action to prevent future deaths. Sinclair said that he welcomed the government Homeless Rduction Act set out by Sajid Javid to reduce the number of people sleeping rough. The Homelessness Reduction Act received Royal Assent in April 2017 and will commence in April 2018. The Act places a new duty on local authorities to help prevent the homelessness of all families and single people, regardless of priority need, who are eligible for assistance and threatened with homelessness. Matt Downie, director of policy and external affairs at Crisis, said: “In 21st-century Britain, nobody should be dying on our streets, especially when there is clear evidence to show that rough sleeping – and all forms of homelessness – can be ended. Back in 2016, Theresa May unveiled the £40 million package designed to prevent homelessness by intervening to help individuals and families before they ‘end up on the streets.’ It was claimed that the ‘shift’ in government policy will move the focus away from dealing with the consequences of homelessness and place prevention ‘at the heart’ of the Prime Minister’s approach. I criticised the approach at the time, as it was framed with a narrative of individualism, and was based on a considerable degree of political prejudice regarding the causes of homelessness, which positioned citizen ‘decision-making’ as a key factor. The Conservatives fail or refuse to recognise that many problems in wider society arise as a consequence of a prejudiced ideology that shapes political decision making, and that contributes significantly towards homelessness. These structural causes include a lack of affordable housing; high levels of poverty, low wages, the high cost of living, unemployment and underemployment; welfare cuts, punitive sanctions and problems with the way benefits system operates. Also, the way that social housing is rationed has a direct impact on levels of homelessness. 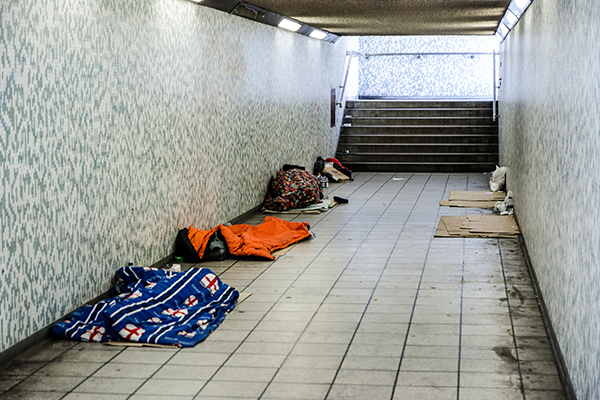 In 2016, Sajid Javid, then Communities Secretary, announced that the Government will support reforms to England’s anti-homelessness laws and strengthen local authority duties to prevent people becoming homeless. But local authorities are already struggling to meet their statutory obligations because of years of underfunding because of the Conservatives’ ideological austerity. The Homelessness Reduction Bill – a private member’s bill put forward by Conservative MP Bob Blackman – will place a duty on local authorities to help eligible people at risk of homelessness to secure accommodation, 56 days before they are threatened with eviction. However, councils have already expressed their concerns regarding delayed government code of guidance and funding on the Homelessness Reduction Act. Announcing the Government’s support of the bill, Javid said: “No one should have to sleep rough on the streets. We want to build a country that works for everyone, not just the privileged few. That’s why we are determined to do all we can to help those who lose their homes and provide them with the support they need to get their lives back on track. Blackman, the Conservative MP for Harrow East, said he welcomed the Government’s decision. He added: “Throughout my 24 years in local government prior to becoming an MP, I saw the devastation that can be caused by homelessness first hand, with too many people simply slipping through the net under the current arrangements. The 2013 annual State of the Nation report by the charities Crisis and Joseph Rowntree Foundation (JRF) revealed that the number sleeping rough had risen by six per cent in England that year, and by 13 per cent in London. There has been a 10 per cent increase in those housed temporarily, including a 14 per cent rise in the use of bed and breakfast accommodation. Writing just a year after the highly controversial Welfare Reform Act was ushered through the legislative process on the back of Cameron’s claim to the “financial privilege” of the Commons , the JRF report authors explicitly blamed the Government’s welfare cuts for compounding the problems caused by the high cost and shortage of housing as demand outstripped supply. The researchers found found that the cap on housing benefit made it more difficult to rent from a private landlord, especially in London, and claimed the controversial “bedroom tax” has caused a sharp rise in arrears for people in public housing, particularly in the Midlands and North. A separate survey by Inside Housing magazine showed that councils and housing associations are increasingly resorting to the threat of eviction, as the loss of an adequate social security safety net is causing increasing hardship for social housing tenants. The reduction of council tax benefit for people who were previously exempt from paying council tax has also contributed significantly to experiences of material hardship, too. Ministers have emphatically denied that their reforms have contributed to the return of homelessness. However, homelessness has now risen in each of the years since the Tory-led coalition was formed – after falling sharply in the previous six years, and has continued to rise rapidly, since. The government’s welfare policies have emerged as the biggest single trigger for homelessness now the economy has allegedly recovered, and are likely to increase pressure on households for the next few years, with the new benefit cap increasing the strain, according to the independent research findings in the Homelessness Monitor 2015, the annual independent audit, published by Crisis and the Joseph Rowntree Foundation. The study said millions of people are experiencing precarious circumstances because of “hidden homelessness”, including families forced by financial circumstances to live with other families in the same house, and people categorised as “sofa surfers” who sleep on friends’ floors or sofas because they have nowhere to live. At the same time, the Department for Work and Pensions also announced that it was cutting funding for homeless hostels and supported housing for disabled people by reducing supported housing benefit rent payments for three years. The homelessness reduction bill in the current policy context is yet another example of how Conservatives don’t seem to manage coherent, joined up thinking. Howard Sinclair, the chief executive of the homelessness charity St Mungo’s, said the cut would leave the homeless charity with £3 million a year less to spend on services. “The rent reduction will threaten the financial viability of some of our hostels and other supported housing schemes and offers no direct benefit to vulnerable tenants who mostly rely on housing benefit to cover their housing costs,” he said. It’s just not good enough that the Government simply attempts to manipulate and colonise progressive rhetoric, claiming they ‘stand for social justice’, when they very clearly don’t walk the talk. Conservative neoliberal “small state” anti-welfare policies are increasing homelessness. The bedroom tax, council tax benefit reductions, housing benefit reductions, welfare caps, sanctions, the deregulation of private sector, the selling off and privatising of social housing stock have all contributed to the current crisis of homelessness. It was particularly remarkable that May claimed the government are “doing the right thing for social justice” yet the Conservative policy framework is, by its very design, inevitably adding to the precariousness of the situations those people with the least financial security are in. Affordable, accessible and safe accommodation brings stability and security; provides a gateway to access health services like GPs; enhances social and community inclusion; and provides the basis for the right to private and family life. A home is vital for good mental and physical health, allowing people to live in safety, security, peace and dignity. Currently there is no such ‘right to housing’ in itself, however, the right to an adequate standard of living, including housing, is recognised in the UN Covenant on Economic, Social and Cultural Rights. Government policies haven’t worked because they overlook the obvious. Despite Theresa May’s claims, the government tends to simply address the effects and not the real causes of homelessness. Unless the government actually address the growing inequality, poverty and profound insecurity that their own policies have created, then homelessness and absolute poverty will continue to increase. You can help a homeless person by contacting Streetlink. (Click) When a rough sleeper is reported via the Streetlink app, or by phone – telephone number 0300-500 0914. The details you provide are sent to the local authority concerned, so they can help connect the person to local services and support. You will also receive an update on what action was taken so you’ll know if the situation was resolved. StreetLink aims to offer the public a means to act when they see someone sleeping rough, and is the first step someone can take to ensure rough sleepers are connected to the local services and support available to them. Thatcher’s “Care in the community”. Cheaper, isn’t it?